Living at altitudes of 7,000 to 12,000 feet, red pandas inhabit the temperate forests of the Himalayas and southwestern China. While the red panda little resembles its distant cousin, the giant panda, both feed mainly on bamboo. Red pandas supplement their diet with fruit, berries and blossoms. 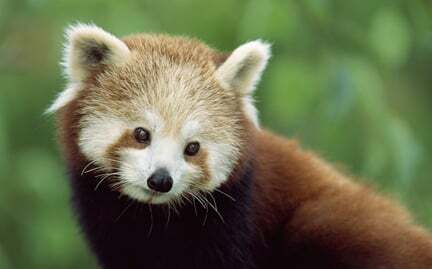 The red panda’s primary predator is the snow leopard, but habitat loss poses the greatest threat to these rare mammals.